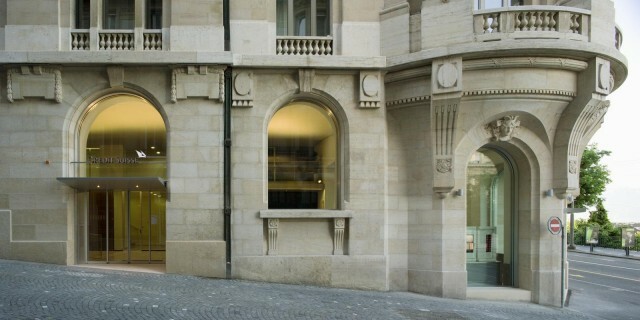 Built between 1911 and 1914, this bank building by architect Eugène Jost with Louis Bezencenet and Maurice Schnell has been owned by the Credit Suisse Group since 1931. 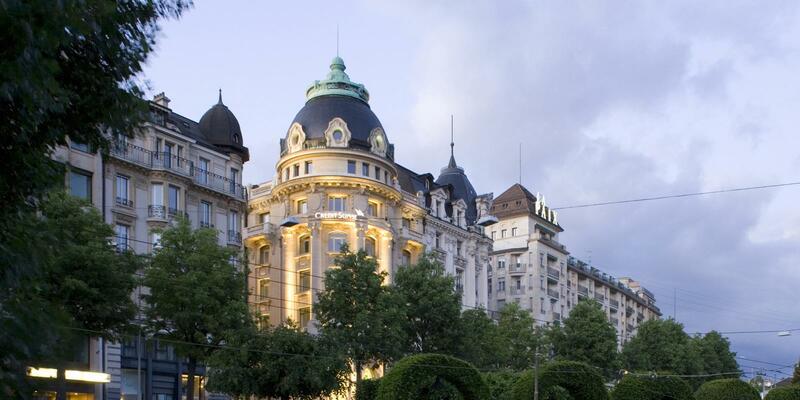 The neoclassical edifice, topped by a large cupola, is strategically located in the center of Lausanne, looking out over the city and the lake toward the Alps. In the 1960s, the building was subjected to massive transformations that obliterated certain features of the original interiors. 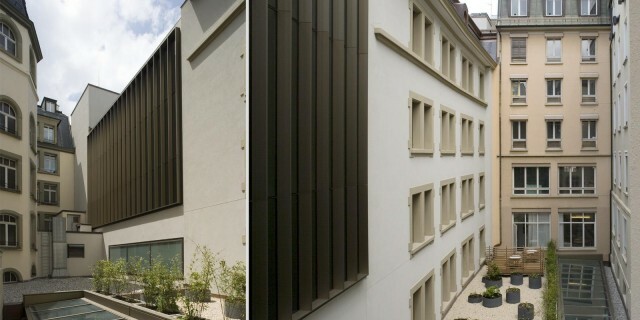 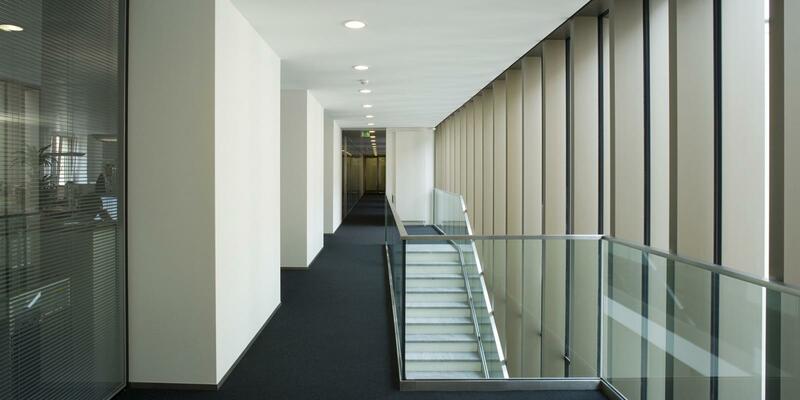 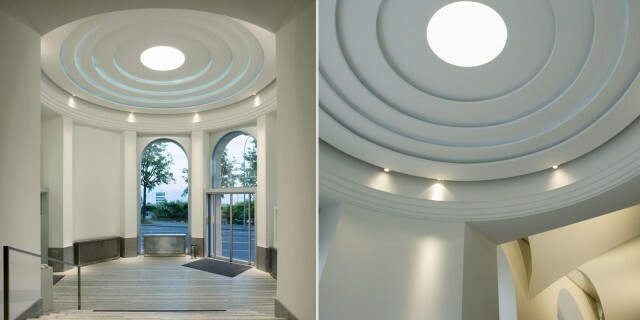 To accommodate current and future functional requirements without compromising the architectural quality of the building, the architects decided to follow a strategy of stripping the interior spaces and floors of the building while preserving and restoring the facades. 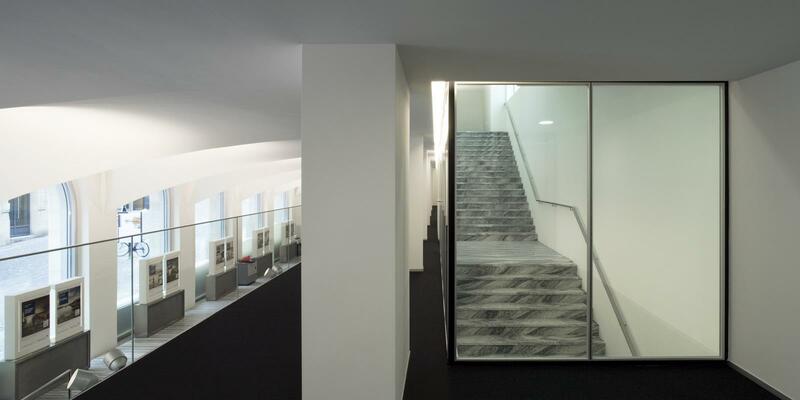 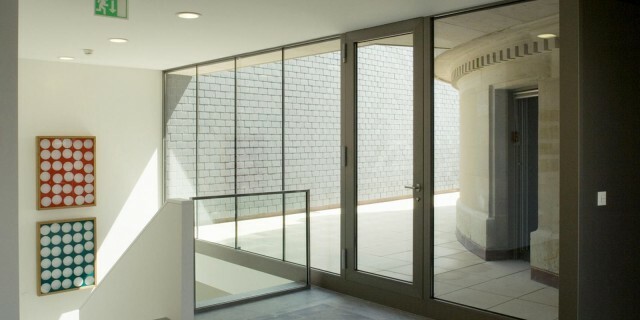 By enclosing an indentation on the east facade of the building, Richter & Dahl Rocha created a glazed interior volume that houses a new staircase providing access to public spaces on the upper floors. 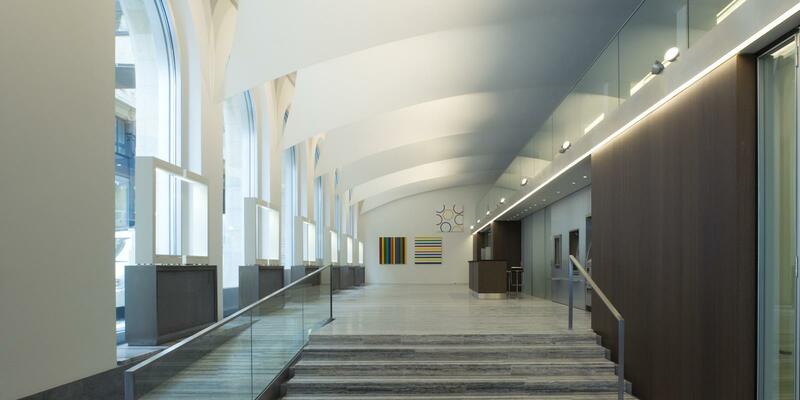 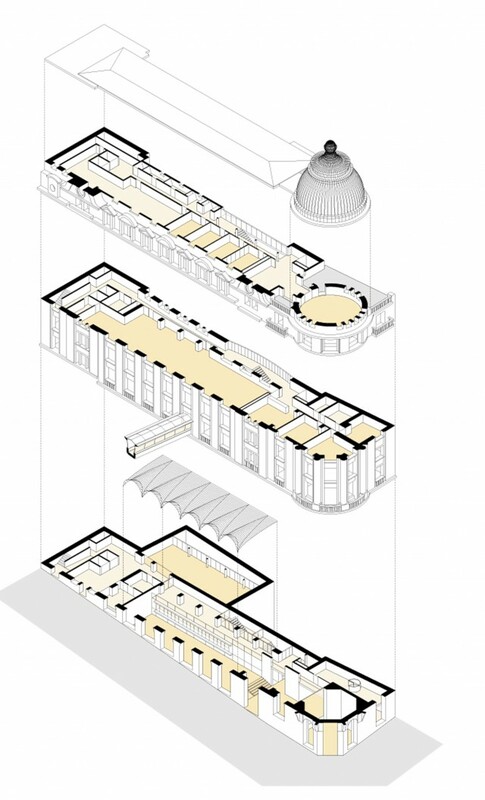 The Credit Suisse program included teller windows, offices for client meetings on the mezzanine and second floors, three floors of private office spaces, and a public area on the fifth floor, with a new circular conference room centered beneath the carefully restored cupola. 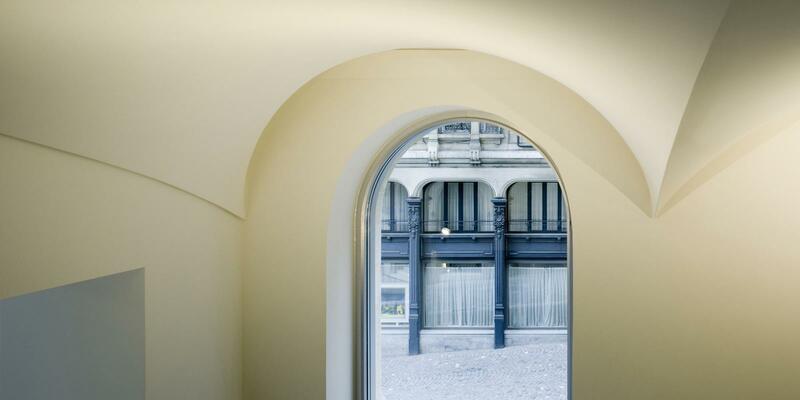 The new pre-cast plaster ceiling of the ground floor hall follows the arcuated form of the original neoclassical windows. Moving from the outer wall, where each arched window is framed by a canopied vault, the ceiling flattens out as it moves inward, becoming a perfectly level surface at the mezzanine. This contemporary gesture simultaneously restores a lost original element of the historic building and invokes the modernist “hung” ceiling.